Have a draft that expresses LP? Our Hardship Registry may be the place for you! 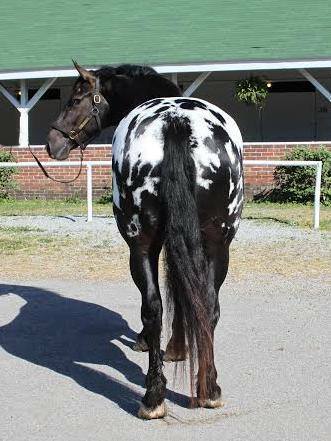 Like most breeds that focus on patterning, ASHDA offers a place in our registry for grade horses close to our conformational standard that also express desired coat pattern. Hardship registration is offered to draft and heavy warmblood type horses that express LP in enough amount to be recognizable. With registration in hand, a hardship horse is given a regular registration number and a place in our permanent stud book. Like any other registered horse, Hardship horses may compete in our Open Show system and record miles in our Trail Log and any future ASHDA sanctioned competition. They can win ASHDA sponsored awards, be featured in our print or online publications and help represent the breed at demos, shows and other activities. Hardship horses are treated as any other registered ASHDA horse is, and are spotlighted for their talents and invited to represent the breed as ambassadors. Hardship gelding, Daisy's Chief Dane. 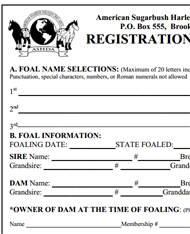 Hardship registration is offered to mares or geldings that meet requirements of coat pattern and conformation. Unlike our other registration categories, there are no required parentage or genetic tests (horses can still be tested if owner wishes and any results are marked down on the horse's papers). Because no testing or known parentage is required, hardship horses have no breeding rights and cannot produce foals that are eligible for ASHDA registration. As such, we will not accept stallions for registration and strongly encourage mares to be spayed, but do not require it. As with all the other areas of registration, horses must adhere to our excessive white rules and will be scored against the breed standard, but will not be judged as strictly as breeding stock. If you have a horse you feel meets requirements, please email our registrar and let us know! You may own a Sugarbush Harlequin Draft and not even realize it!